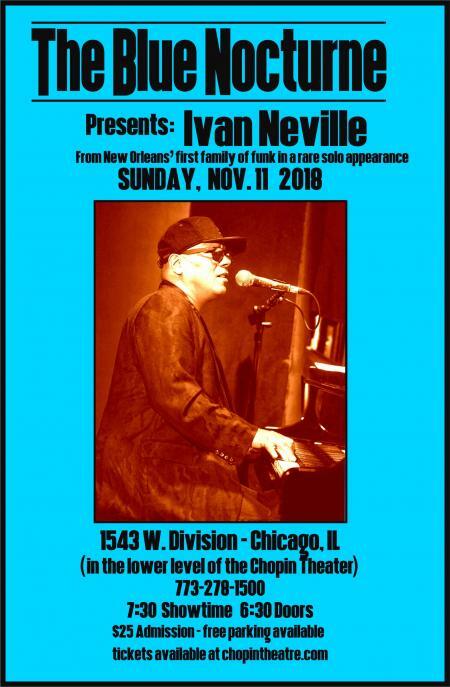 Sunday Nov 11th - A rare solo performance on grand piano and vocals by Ivan Neville, from the first family of New Orleans R&B, soul and funk, in the classic, vintage style and intimate musical setting of The Blue Nocturne. Tickets $25. Doors 630pm. Concert 730pm. A rare solo performance on grand piano and vocals by Ivan Neville, from the first family of New Orleans R&B, soul and funk, in the classic, vintage style and intimate musical setting of The Blue Nocturne. Leader of the world renowned New Orleans funk group, Dumpstaphunk for over a decade, Ivan, (son of Aaron Neville) has been a top drawer recording artist, songwriter and sideman since his early teens. In addition to releasing four critically acclaimed albums under his own name, Ivan has recorded with the Rolling Stones, Robbie Robertson, Rufus, Don Henley and Paula Abdul - to name a few - and was a touring member of the bands of Keith Richards and Bonnie Raitt. The show will be hosted by Chicago music icon and recording artist Nicholas Tremulis, who during the course of the performance, will conduct an in-depth interview with Mr. Neville, painting a picture through songs and stories about what it is to grow up in the New Orleans music scene and be a part of such an incredible musical family and legacy. THE BLUE NOCTURNE is located downstairs in the historic Chopin Theatre at 1543 W Division St, Chicago, IL.